The NWHL kicks off its fourth season on Saturday, October 6 and there’s something definitely different about this season. A new team. The Minnesota Whitecaps have joined the league as its fifth team and will be hosting the reigning Isobel Cup champion Metropolitan Riveters for a pair of games on opening weekend. Last year’s runner-up, the Buffalo Beauts, will make their season four debut on October 7 when they pay a visit to the Connecticut Whale. The Boston Pride have to wait a week to make their debuts and will open the season on October 13 when they host the Riveters. The primer below will fill you in on what you need to know about each of the league’s five teams as they battle for the Isobel Cup. With the 2018 Winter Olympics now in the rearview mirror, the NWHL’s rosters are laden with superstars – including ten members of Team USA’s gold medal squad sprinkled throughout four of the five teams, as well as the league’s first Finnish, Swedish, and Czech players. Two of the Founding Four teams have new bench bosses this season, and the first overall pick in the 2017 NWHL Draft – goaltender Katie Burt – is signed and ready to make her professional debut. Last Season: 3rd place, 4-8-4 (12 points), eliminated in semifinals by Buffalo. New Faces: Denisa Křížová (F), Katie Burt (G), Taylor Wasylk (D), Toni Ann Miano (D), McKenna Brand (F), Dru Burns (D), Lauren Kelly (D). Pride of the Eagles: There are nine players on the Pride this season who are alumna of Boston College – Katie Burt, Haley Skarupa, Taylor Wasylk, Toni Ann Miano, Emily Field, Kaliya Johnson, Dru Burns, Dana Trivigno, and Lexi Bender. Building Through the Draft: Six players on the Boston roster were drafted in 2017 – Burt (1st overall/Boston), Mallory Souliotis (8th/Boston), Brand (11th/Riveters), Křížová (13th/Connecticut), Miano (15th/Riveters), Kelly (16th/Boston). Three others were drafted in 2015: Haley Skarupa (5th/Riveters), Lexi Bender (11th/Boston), Dana Trivigno (13th/Riveters). OG Pride: Alyssa Gagliardi, Jordan Smelker, Jillian Dempsey, Emily Field, and Brittany Ott are entering their 4th NWHL seasons, all with Boston; Kaleigh Fratkin is also entering her fourth season (CT/Rivs/2 Boston). Player to Watch: Haley Skarupa returns to the Pride this season with a gold medal around her neck. The 24-year-old put up five points (2g-3a) in five games with Boston last season before she was a late addition to Team USA’s eventual gold medal-winning team. In her first NWHL season (with Connecticut) Skarupa racked up 22 points (11g-11a) and had two assists in her lone playoff game. With 27 points in 21 career games, it’s safe to say she will be one of the offensive leaders on a Pride team that is looking to make a third trip to the NWHL Final in four seasons. Welcome Home: In addition to Skarupa, forward Amanda Pelkey and defender/forward Gigi Marvin also return to the Pride this season bearing gold medals; both players played for Boston during their first two seasons. Last season: 2nd place, 12-4-0 (24 points), Isobel Cup runner-up. New Faces: Shannon Szabados (G), Nicole Hensley (G), Dani Cameranesi (F), Blake Bolden (D), Julianna Iafallo (F), Annika Zalewski (F), Savannah Harmon (D), Kelly Babstock (F). Buffalo Stampede: No other NWHL team made more ‘WOW’ signings this summer than Buffalo did, as they shocked followers of the league by signing an Olympic goaltender from both Team Canada and Team USA (Szabados, Hensley), signing Babstock – who is 6th in the league all-time with 40 points – and was a star with the Whale, and signing Bolden – who played with Boston the first two NWHL seasons and played professionally in Switzerland last season. Building Through the Draft: Six players on the Buffalo roster were drafted in the NWHL – 2017: Harmon (6th/Buffalo), Zalewski (14th/Buffalo). 2016: Cameranesi (3rd/Connecticut), Hayley Scamurra (10th/Buffalo), Maddie Elia (18th/Buffalo) 2015: Emily Janiga (16th/Buffalo). OG NWHLers: Corinne Buie (1 Boston/3 Buffalo) and Babstock (3 CT/1 Buffalo) are the only two players on the roster that have been a part of the league since it’s inception. Player to Watch: Hayley Scamurra has been a force to be reckoned with, putting up 15 points (8g-7a) in 15 career NWHL games and five points (1g-4a) in four career playoff games. She was one half of a dynamic duo alongside Elia for the majority of last season as they terrorized opponents week-in and week-out last season. Scamurra was named Rookie of the Year at the end of last season and was also named co-MVP at the league’s All-Star Game in St. Paul after finishing the game with four points (3g-1a). 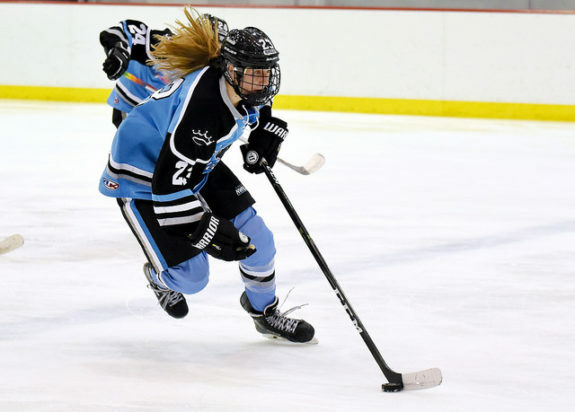 Welcome Home Emily(s): The Beauts welcome back both Emily Pfalzer and Emily Janiga this season, two players who were instrumental in the franchise’s Isobel Cup win back in 2017. Janiga played last season in China with the Vanke Rays in the CWHL, and Pfalzer was a member of Team USA’s gold medal-winning squad. Last season: 4th place, 3-11-2 (8 points), eliminated in semifinals by Riveters. New Faces: Meeri Räisänen (G), Kayla Meneghin (F), Kim Tiberi (D) , Sarah Schwenzfeier (F), Melissa Sheeran (F), Nina Rodgers (F), Sarah Hughson (F), Randi Griffin (F), Michelle Löwenhielm (F), Maria Sorokina (G), Sam Walther (G), and Katerina Mrázová (F). Making a Splash: Connecticut signed three new netminders this off-season, first signing Walther, then Sorokina, and most recently (October 1) Räisänen. Like Buffalo, all three of the goalies on their roster have yet to play a game in the NWHL yet. It will be interesting to see which of the three will take the reigns as the Whale attempt to avoid finishing in last place for a third consecutive season. Building Through Draft: Although they only had four draft picks in the 2017 NWHL Draft (one traded to Boston in the Zoe Hickel deal), two of them will be on the team this season – Samantha Donovan (5th overall) and Rodgers (17th overall) and three will be in the league this season – Denisa Křížová (13th overall) signed with Boston this summer. 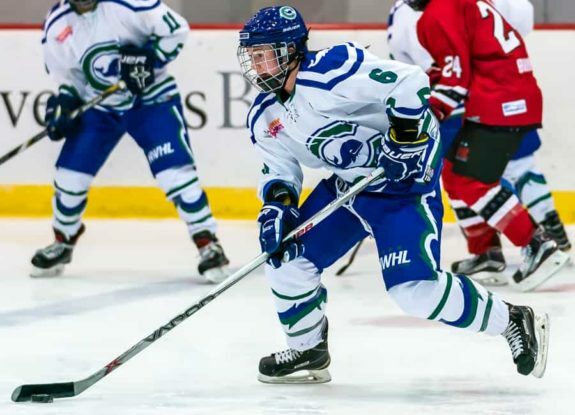 OG Whale: Defenders Shannon Doyle and Jordan Brickner are both entering their fourth NWHL seasons, all with Connecticut. Elena Orlando is also entering her fourth season (Rivs/3 CT). 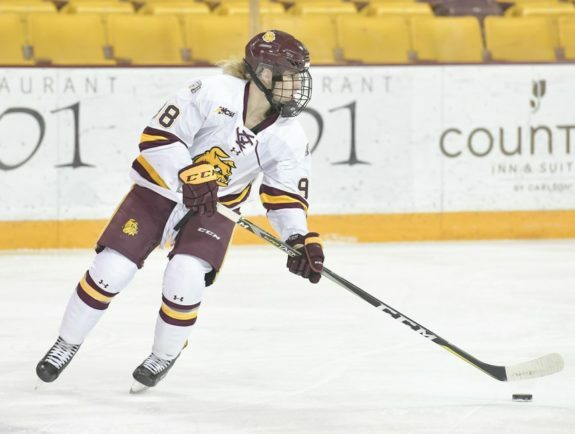 Player(s) to Watch: Connecticut is no stranger to having players who played at the University of Minnesota-Duluth (Hickel, Meghan Huertas) and they added two Bulldogs this off-season when they signed the league’s first Swedish player in Löwenhielm and the league’s first Czech in Mrázová. Both players were in the top nine in scoring for their school last season. On a team that needs to find someone else to put the puck in the net besides Emily Fluke, these two could be an answer in that department. Double Duty: On August 20 the Whale announced that defender Cydney Roesler would be returning for her third season with the team and that she would also be Connecticut’s new assistant coach. This is the first time in the NWHL that a player will be coaching and playing during the same season. Roesler was a volunteer assistant coach at her alma mater, Quinnipiac University, last season. Last season: 1st place, 13-3-0 (26 points), Isobel Cup champions. New Faces: Kristin Lewicki (F), Fiona McKenna (F), Audra Richards (F), Chelsea Ziadie (D), Alexa Aramburu (F), Lexi Slattery (D). Defenders of the Cup: 15 players from the Rivs championship roster are returning in an attempt to become the NWHL’s first back-to-back champs: Katie Fitzgerald, Kimberly Sass, Sarah Bryant, Michelle Picard, Courtney Burke, Jenny Ryan, Kelsey Koelzer, Kiira Dosdall, Madison Packer, Kelly Nash, Rebecca Morse, Miye D’Oench, Alexa Gruschow, Rebecca Russo, and Erika Lawler. Building Through the Draft: Five players on the Riveters’ roster were drafted in the NWHL – 2016: Koelzer (1st/Riveters), Ryan (9th/Riveters). 2015: Burke (4th/Buffalo), Picard (6th/Connecticut), D’Oench (15th/Boston). 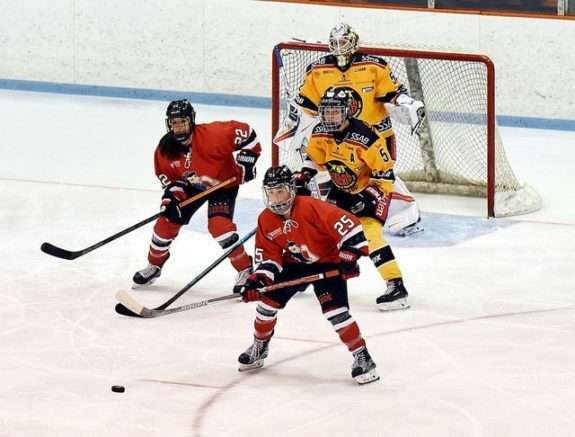 OG Rivs: Forward Madison Packer and defender Kiira Dosdall are both entering their fourth NWHL seasons, all with the Riveters. Player to Watch: In 14 games Kristin Lewicki had five goals and seven points as a rookie with Buffalo last season (also one assist over two playoff games) and ‘Wheels’ won the Fastest Skater event at the NWHL All-Star Game in St. Paul as well. Now the former scoring star at Adrian College (179 points/90 goals in 113 games) joins the defending champs who are reloaded for another run at the Cup. With Lewicki and Russo wearing red and black this season the Rivs team speed could be off the charts. Welcome Home Kessel: After winning a gold medal with Team USA at the Olympics in Pyeongchang Amanda Kessel returns to the Riveters to aid their title defense. The 27-year-old star had a mind-blowing 18 points (4g-14a) in just eight games with the Rivs in 2016-17 and now she is back to pursue a pro championship after winning an Olympic gold medal, two World Championship gold medals, and three NCAA titles. NWHL Vets: Only three players on the Whitecaps inaugural roster will not be considered rookies this season. Amanda Leveille (Buffalo) is entering her third season in the NWHL, Sydney Rossman (Connecticut) and Amanda Boulier (Connecticut) are entering their second pro seasons. UnCapped Expectations: Though they may be an expansion team, there is plenty of talent and experience throughout Minnesota’s lineup. 24-year-old Lee Stecklein will anchor the blueline and will be making plenty of premier passes to offensive dynamos and fellow gold medalists from Team USA Hannah Brandt and Kendall Coyne-Schofield. Building Through the Draft: Seven players on the Whitecaps roster were drafted in the NWHL – 2017: Amy Schlagel (18th/Buffalo). 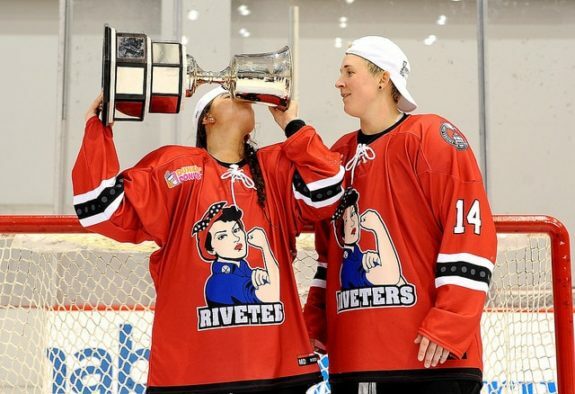 2016: Stecklein (2nd/Buffalo), Amy Menke (17th/Riveters), Rossman (19th/Connecticut). 2015: Brandt (2nd/Connecticut), Coyne-Schofield (3rd/Boston), Leveille (12th/Buffalo). Player to Watch: A former competitive speed skater, Allie Thunstrom just might be the most interesting player in the league. The 30-year-old not only has speed for days, but she was a scoring star at Boston College with 139 points (86g-53a) in 141 games. In Minnesota’s final preseason game (September 24) Thunstrom brought the thunder with a hat trick against the UBC Thunderbirds. Welcome Home: Of the 25 players on the Whitecaps inaugural NWHL roster, 18 of them were born in the state of Minnesota – Julie Friend, Rossman, Winny Brodt-Brown, Chelsey Brodt-Rosenthal, Lisa Martinson, Shlagel, Emma Stauber, Stecklein, Lauren Barnes, Brandt, Jonna Curtis, Kalli Funk, Sadie Lundquist, Menke, Meaghan Pezon, Kate Schipper, Haylea Schmid, and Thunstrom.